As a professional association with members in more than 65 countries, the International Association of Facilitators (IAF) is well placed to recognise the power of facilitation worldwide. For more than 20 years we have been strong advocates for the power of facilitation in helping organisations to address challenges and achieve results. 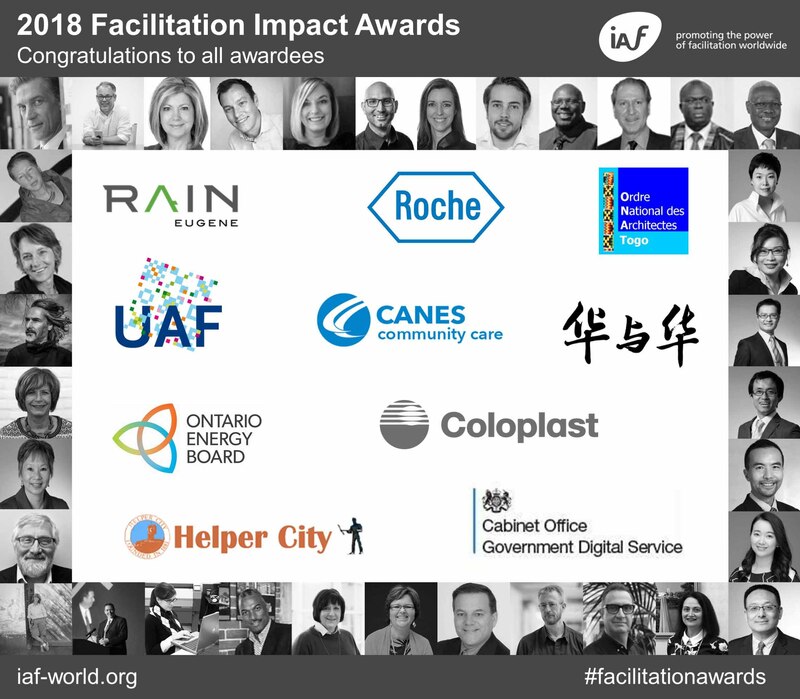 The Facilitation Impact Awards (FIA) honours organisations that have used facilitation to achieve a measurable and positive impact as well as the facilitator(s) who worked with them. To nominate, prepare a submission and email it to FIA@iaf-world.org by 11pm Sunday 26 May 2019 (GMT). See Facilitation Impact Award Guidelines for criteria. Click here to watch a webinar with past awardee Tamara Eberle. Tamara has, with her clients, received 5 Platinum and 2 Gold Facilitation Impact Awards over the past 5 years. A great achievement Tamara! Congratulations to all the organisations and facilitators who have been recognised for demonstrating the power of facilitation worldwide in 2018. Click here to find out how they used facilitation to have a positive impact on the challenges they faced. Being an evaluator is an opportunity for you to support a global community of practice and learn more about how organisations and facilitators use facilitation and the IAF core competencies. We are looking for IAF members to evaluate submissions in English, Spanish, French and Portuguese. 3-16 June to discuss scores with other evaluators—you will only need to do this step if there is a wide spread in the scores each evaluator gives a submission. If you would like to volunteer, email FIA@iaf-world.org by Sunday 28 April 2019 and let us know which languages (English, Spanish, French, Portuguese) you can evaluate in. Evaluators may be nominated in a submission for an award, but they are not allowed to evaluate submissions in which they are named. The Facilitation Impact Awards Governance Policy includes information on probity requirements for the awards.